Adidas Libro Cricket Bats stocked at All Rounder Cricket. 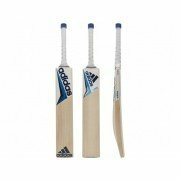 The Adidas Libro Cricket Bat is hand crafted from top quality hand selected English Willow and is contoured to produce a feather-light pick up and great balance. The Libro range of bats are endorsed by England's Stuart Broad and David Willey. Our Adidas Libro cricket bats feature a high middle, delivering unparalleled balance, the lightest feel and a spectacular pick-up – perfect for the all-round batsman who demands exceptional playability and likes to play 360 degrees around the field. Adidas Libro cricket bats 2017 include asymmetric 3 stripes design, modernised 3D graphics and a new ergonomic octopus grip for improved feel.